The Supreme Court Building is open to the public from 9 a.m. to 4:30 p.m. The Court will convene for a public session in the Courtroom at 10 a.m. The Justices will hear two, one-hour oral arguments. The Court may announce opinions, which are posted on the homepage after announcement from the Bench. Courtroom Lectures available within the next 30 days. The Court convenes for a session in the Courtroom at 10 a.m. The session may begin with the announcement of opinions - decisions in argued cases - followed by the swearing in of new members to the Bar of the Supreme Court. Unless otherwise noted, the Court generally hears two, one-hour oral arguments, with attorneys for each side of a case given 30 minutes to make a presentation to the Court and answer questions posed by the Justices. These sessions are open to the public. The Court convenes for a session in the Courtroom at 10 a.m. The session begins with the announcement of opinions - decisions in argued cases - followed by the swearing in of new members to the Bar of the Supreme Court. These sessions, which typically last 15-30 minutes, are open to the public. The Justices meet in a private conference to discuss cases argued earlier that week. The Justices also discuss and vote on petitions for review. The building is open to the public but the Justices do not take the Bench. The Court is closed on federal holidays. For questions on how the holiday impacts case filings, contact the Clerk's Office. The transcripts of oral arguments are posted on this website on the same day an argument is heard by the Court. Same-day transcripts are considered official but subject to final review. 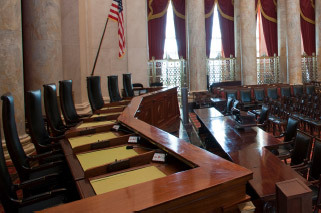 The audio recordings of all oral arguments heard by the Supreme Court of the United States are available to the public at the end of each argument week. The audio recordings are posted on Fridays after Conference. Under the Federal Arbitration Act, an ambiguous agreement cannot provide the necessary contractual basis for concluding that the parties agreed to submit to class arbitration. Certiorari dismissed as improvidently granted. Baze v. Rees, 553 U. S. 35, and Glossip v. Gross, 576 U. S. ___, govern all Eighth Amendment challenges alleging that a method of execution inflicts unconstitutionally cruel pain; petitioner’s as-applied challenge to Missouri’s single-drug execution protocol—that it would cause him severe pain because of his particular medical condition—fails to satisfy the Baze-Glossip test. A vocational expert’s refusal to provide private market-survey data during a Social Security disability benefits hearing upon the applicant’s request does not categorically preclude the testimony from counting as “substantial evidence” in federal court under 42 U. S. C. §405(g). On April 19, 1938, a Constitution Tree was planted on the grounds of the Supreme Court Building. The tree, a scarlet oak, was one of hundreds of Constitution Trees planted across the country, and was donated by the Maryland Chapter of the Daughters of the American Revolution. Other participants in the planting ceremony included the United States Marine Band and Boy Scout troops from Riverdale and Hyattsville, Maryland. Sadly, the Constitution Tree suffered damage and was removed in November 2016. 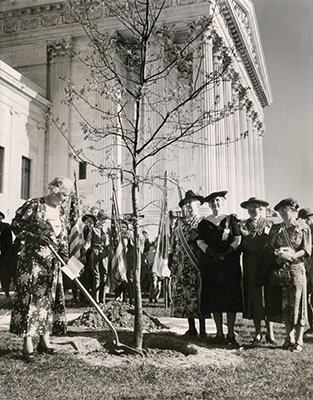 Members of the Maryland Chapter of the Daughters of the American Revolution plant a Constitution Tree in 1938. Mrs. William Chase (holding shovel) was the chair of the chapter’s Conservation Committee, and requested permission from Chief Justice Charles Evans Hughes, who secured the agreement of the rest of the Justices.